Manage your organization's library of safety data sheets using Chemical Safety's cloud-based SDS management software. Employees can easily search and print manufacturer specific SDS's. Everything you need to create an online library of safety data sheets. Includes safety data sheets with current revision dates from major manufacturers. An online SDS management system that's easy to use, maintain, and deploy. Supports importing SDS's from legacy systems. Cross-Reference your safety data sheets with hazard and safety data from Chemical Safety's proprietary chemical reference database. Manage SDS history and generate SDS-specific reports. Cross-reference chemicals with federal and state regulations. Add and update SDS's quickly! Our Global SDS database contains SDS's with current revision dates from most of the major manufacturers. Keep better track of the chemicals that are being used in your facility. Review and authorize purchase requests for users and locations. View safety data sheets on the go. We offer apps for all major platforms including Android (phone and tablet), iOS (iPhone and iPad), and Windows (UWP). Manage GHS rules and labeling. Are you still maintaining your safety data sheets in a paper binder? There is a better way! Migrating to a cloud-based database will not only lower your administrative costs, it will also improve workplace safety by making it easier for your employees to access SDS's. Despite complex and continuously evolving regulatory requirements, it’s never been easier for companies to manage Safety Data Sheets- provided they have the right Safety Data Sheet software. Chemical Safety offers free online access to a database of supplier-specific Safety Data Sheets (SDS’s). We also offer Android and iOS mobile applications which provide wireless access to our Safety Data Sheet (SDS) database from iPhones, iPads, and Android devices. The EMS environmental health & safety software suite is cloud-based, easy to use, and highly customizable. Subscribers have the ability to upload their own Safety Data Sheets so you’ll be able to quickly build and organize your library of SDS’s. And, it’s cost effective! In most cases you will pay less to maintain your Safety Data Sheet database with us than if you were to hire an outside service or do the work internally. Image or text based SDS’s can be viewed organization wide over the internet, corporate intranet, or local/wide area networks. An easy to use search screen makes finding the most up to date version of the Safety Data Sheet simple and quick. By entering the product name, manufacturer and SDS number, the SDS is displayed for viewing or printing. Safety Data Sheets are OSHA and International regulation compliant for instant hazard information access. Most importantly, SDSs are tightly integrated with Chemical Safety’s EMS Chemical Inventory Tracking module so SDS’s data is linked to chemical inventory for increased workplace safety and ease of use. 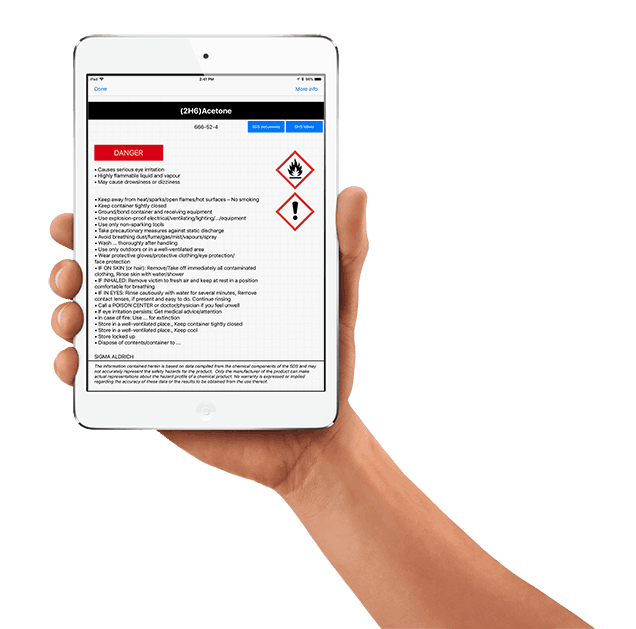 Chemical Safety’s Safety Data Sheet (SDS) applications for Android and iOS mobile devices extend the reach of EMS in a convenient and cost-effective way. These applications are multi-lingual tools that provide wireless access to your specific Safety Data Sheets as well as our chemical reference database so you can quickly retrieve critical data for safety, EH&S regulatory compliance and emergency response and emergency response. Chemical Safety’s EH&S mobile apps for iOS are available through the Apple’s App Store and the Android EH&S mobile apps are available through the Google Play Store or the Amazon Appstore. Chemical Safety’s EMS Safety Data Sheet software is fully integrated with our chemical inventory tracking software, our hazardous waste management software and our chemical reference database (which includes chemical properties, hazard data and regulatory data for 80,000+ chemicals). The database also includes EPA designated hazardous chemicals as well as compliance, regulatory, chemistry, storage, and labeling data. The EPA List of Lists, a database of federal regulations, has been linked and cross-referenced against all chemical reference allowing for safe storage classification and labeling of chemicals. Chemical Safety’s environmental compliance software features on-demand reports that can be customized with ease. The EMS reporting module comes with an extensive set of pre-configured reports that can be edited to meet specific regulatory and corporate requirements. The Environmental, Health and Safety (EHS) department of a global manufacturer of electronic components, with facilities in the US and many other countries was faced with the daunting task of relabeling huge site chemical inventories as required by the newly enacted GHS labeling requirements. Additionally, the company was required to source and update hazard documents (Safety Data Sheets or SDS) for all existing chemicals in the various sites. Chemicals inventories were up-to-date through the use of Chemical Safety’s EMS EHS software, which streamlined where chemical information update were necessary. Chemical Safety Software was tasked with implementing a rapid and cost-effective solution to address this the needs of this organization, Chemical Safety matched the existing chemical inventories to its vast database of Safety Data Sheets (SDS) and its most up-to-date GHS chemical reference database. Chemicals matched with existing inventories seamlessly, and SDS documents were automatically attached to the chemical container records for each site and location. With the majority of chemicals matched, in a matter of only a few days, the remaining missing data was identified, information was sourced from manufacturers and distributors and the whole project was completed in less than 60 days. Chemical Safety was subsequently tasked with maintaining and updating this organization’s SDS data, and assuring that the required safety and labeling information is available as required. This information is not only available on the cloud for the company to access worldwide, but it is also available o all employees of the company on their smartphones and tablets (iOS, Android and Microsoft Surface). The solution was well received by all involved within the company EHS as well as corporate management.